Homemade chicken pot pie and a robust dose of confidence landed the Starkville youth a spot in the competition and a trip to New York, where the episode was filmed in August. In this spin-off of the popular show “Chopped,” four junior contestants square off each week. They are tasked with preparing three dishes — an appetizer, entree and dessert — in progressive rounds, using ingredients found in a mystery basket, however unlikely those ingredients may be. At the end of each course, a panel of judges “chops” one chef. The last cook standing takes home $10,000. Mark admits he may have been a little nervous as filming began, but that didn’t last long. He had too much to think about. Once presented with a mystery basket, participants had only 30 minutes to whip up the assigned dish. 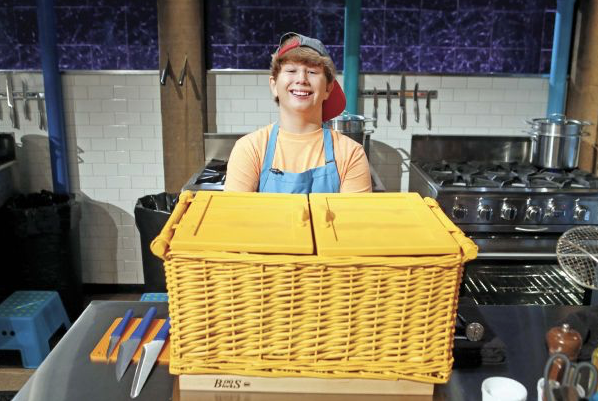 The Armstrong Middle School student said the whole experience — including meeting show host Ted Allen and judges Elizabeth Chambers, Amanda Freitag and Lee Anne Wong — was an exhilarating adrenaline rush. The whole family made the journey to New York: Mark, mom and dad Bonnie and Robbie Coblentz, and Mark’s brother, David, 14. Robbie accompanied Mark to the TV studio each day, where contestants’ parents figuratively bit their nails watching on a green room monitor as their sons and daughters cooked under pressure on set.